This era of accountability reporting, program evaluation, and debate over student achievement is the driving force behind an emerging form of student assessment. Portfolios are purposeful collections of student work representing an array of performance that can be assessed by the students themselves, their teachers, school officials, and even parents. Although this concept isn’t novel by any means, the advent of digital portfolios makes it possible to include more and varied types of works. With digital portfolios, students can create dossiers that travel with them throughout their educational careers. Writing samples, photos, art, voice and video recordings are some of the items students may chose for their digital portfolios. In this presentation, teachers will learn of some of the platforms that can be used to create digital portfolios for their students’ work. There will be examples of student work, rubrics for teacher evaluation, and rubrics for students’ self-reflection. This webinar will briefly detail the rationale behind the use of student portfolios. Participants will see an overview of a few platforms for digital portfolios. Portfolio entries will be in the form of writing, art, video and voice recordings. Participants will receive sample rubrics for teacher evaluation of the work as well as rubrics for students to be self-reflective of their work. There will also be handouts detailing directions for setting up the digital portfolios, some of the platforms that can be used, and hyperlinks to some of my students’ digital portfolios. “Designing Performance Assessments in the Communicative Modes” with Jennifer Eddy, Ph.D. This webinar guides teachers on the design of performance assessment tasks. 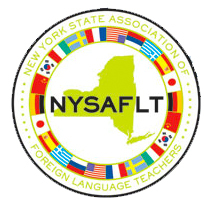 Using the three modes of communication aligned with the NYS Syllabus topics, we will design a thematic trio of tasks that show what learners can do. Participants will learn how to develop tasks in the Interpretive, Interpersonal, and Presentational Modes, use culturally authentic material, turnaround a task for transfer, and plan backward from performance goals.These tasks foster key behaviors indicated in the Common Core and the Framework for 21st Century Skills. See how performance assessment develops critical thinking, engages flexibility, and encourages a self-directed learner. Nancy first addressed LOTE and the Common Core Standards in a March 2012 webinar. To continue the discussion, she will present 1) a review of the Common Core for Literacy Key Ideas, 2) a menu of potential module components, and 3) a step-by-step demonstration of the creation of a sample module for French, applicable to all languages. Participants are invited to address the Common Core Standards by creatively combining the module components.